The restaurant is located on Halstead Avenue just a short ride from the train station. The place was definitely not busy but I think it was due to it being New Year's Day. We decided to choose a table in the bar area instead of the large dining room. The menu has typical Italian fare along with a blackboard filled with specials of the evening. We began by ordering drinks; two unsweetened iced teas as we perused the menu. We decide to share the clams oreganata as an appetizer. I chose the Rigatoni Vodka and Liz chose the Gnocchi in marinara sauce with fresh mozzarella. Our waitress brought out a bread basket along with a plate of bruchetta, salt cured black olives and stuffed roasted peppers. The bruchetta and olives were quite good but the peppers were very spicy. Our appetizer arrived steaming hot to the table. The portion was perfect for two and very tasty. The sauce was perfect for dipping pieces of Italian bread. Our entrees arrived a few minutes after our appetizer was cleared and were large servings. My rigatoni was perfectly cooked and I must admit it was one of the top three Vodka sauces I have ever tasted. 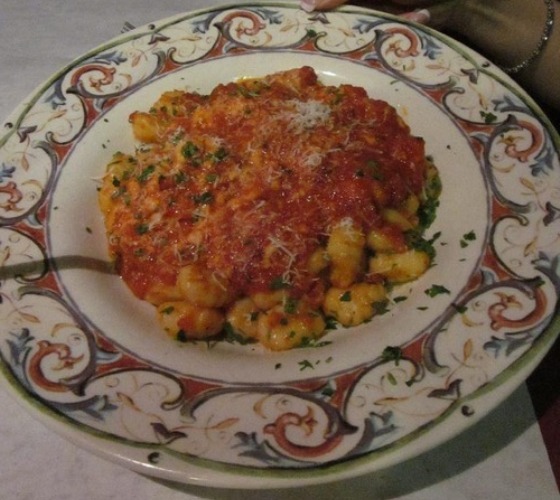 My wife loved her Gnocchi and upon tasting some myself, I was impressed by the freshness of the pasta. Needless to say we couldn't finish our plates and asked for the remainder to be wrapped up. Our waitress then brought us a plate of assorted Italian cookies while Liz ordered a cappuccino. The cookies were a perfect finish to the meal and my wife loved her cappuccino. This place is an excellent find and so close to our house; we will definitely be back for another terrific meal.